Welcome to THE VETTE NET, the oldest online Corvette business, a place where enthusiasts come to meet when selling their prized cars, a place where we connect them with the best match and arrange a smooth and mutually profitable transaction. Our company is also a proud Lifetime Business Member of the National Corvette Museum. Back in 1973, due to intense pressure from insurance companies and the infamous fuel shortage, Chevrolet started to implement some drastic changes when it came to appearance and performance. First of all, it seemed that it was very expensive to replace a damaged Chrome bumper, so the first step was to replace the coveted front bumper with a "plastic" or polyurethane cover. This created a unique look for this model year with only one Chrome bumper on the rear. Performance also suffered since engines had to comply with more stringent emissions. Our offer today is a very fine example of this vintage in excellent condition and very original with only 73K documented miles. To start with, it comes with the standard L48 350 engine conservatively rated at 190 HP. It is original and has the proper matching numbers (VIN and CLA suffix on the engine pad) as seen in the pictures. It is equipped with Power Steering, Power Brakes and Air Conditioning which blows cold air. Vacuum system was refreshed and is working perfect. Check out the virgin engine compartment even with the original air intake rubber boot! Engine is mated with the automatic transmission which shifts smoothly as it should. Undercarriage is very clean with no signs of rust or abuse and the rubber parts appear to be in good condition. Exhaust is original and only newer mufflers are present. Note the very nice condition of the spare tire carrier with the factory lock and key mechanism. It also has new brakes, calipers, brake lines, new master cylinder, etc. Nice tires, Rally wheels with correct, if not original, Chrome "beauty rings and dog dish centercaps". Interior is very nice and features original carpet, door panels, dash, console with the addition of correct looking cloth seat covers with suede inserts, good looking, but not a factory options. Instruments and gauges are functional and there are no cracks or signs of excessive wear. The whole appearance is consistent with the fact that the car was well taken care of and with the low miles shown by the odometer (73K). All lights work. Paint on the car is the correct Mille Miglia Red and it appears that a newer paintjob was applied sometime 5-10 years ago. Needless to say, it is still in excellent condition with no scratches, cracks, fading ect. Chrome is also excellent as seen in the pics. Car runs and drives excellent. Here is your chance to own a rare piece of Corvette history, the last of the "Bumper cars" even though it was only in the back. With its condition, provenance, uniqueness, we believe that this car has a great appreciation potential. Located in FLORIDA, we can assist with delivery nationwide and all over the world. Corvette trades are considered, also financing is provided. For information about this car, please contact Ken@TheVetteNet.com or call toll-free 866.838.8363 (866-VETTENET) or +1(941) 586-9924, International. 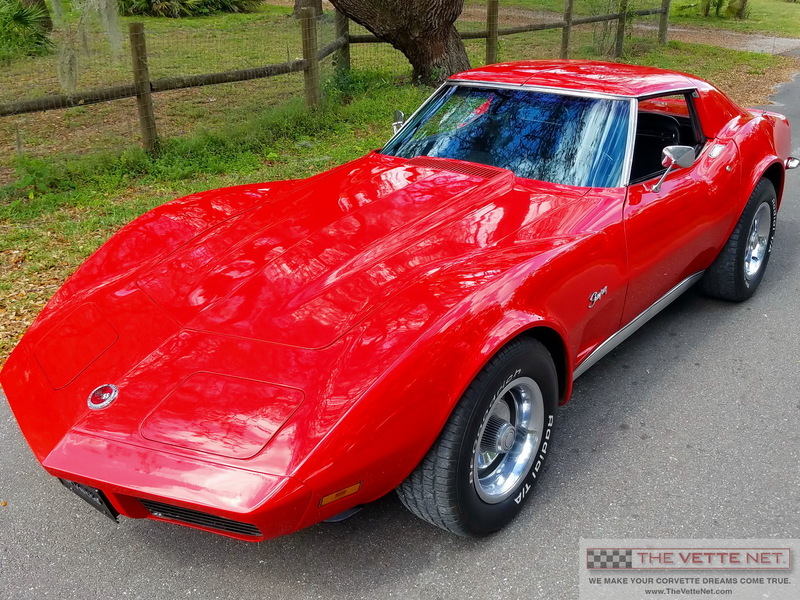 Since 1998, THE VETTE NET (on the Net at www.TheVetteNet.com) has established itself as the premier source for buying, selling and leasing Corvettes, with thousand of enthusiasts assisted nationwide and international. We drive Vettes, we live the life-style, and enjoy the hobby. Our Motto is "UnderCommit - OverDeliver" and we guarantee a pleasant and straightforward experience. Do you have a Vette for sale? If yes, you may want to take advantage of our unique FREE marketing program requiring no upfront fee and no exclusivity. We are expanding! Are you a Corvette fan who is looking to mix his/her passion with helping other enthusiasts buy or sell their prized cars? Generous commissions, flexible time, no upfront commitment are some of the perks... If interested, we would like to hear from you via email Info@TheVetteNet.com or by calling toll-free 866.838.8363.